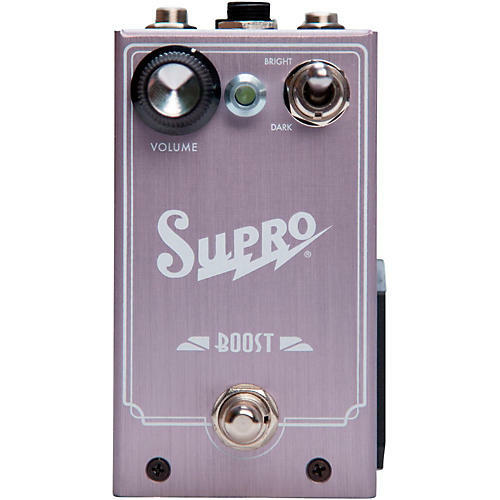 There is no better pedal for transparently driving a tube amp than the Supro Boost. This J-FET based pedal design delivers up to 20db noiseless gain boost plus optional High Pass or Low Pass filtering to contour your sound. Simple, straight-forward and effective, the Supro Boost pedal remains clean and sweet at all settings, no matter how hard you push it with other pedals earlier in the chain. The Supro boost also remains frequency linear as the gain is adjusted, allowing the musician to set the desired level of boost without sacrificing overall tone or requiring them to adjust their amp's EQ settings to compensate.